Stacy Lee of Vancouver, B.C., won three gold medals as McGill captured the Geraldine Dubrule trophy as national champions of the Canadian University Synchronized Swim League at Carleton University on Sunday. It marked McGill's second consecutive CUSSL title and 12th overall since the league was formed in 2001-02. 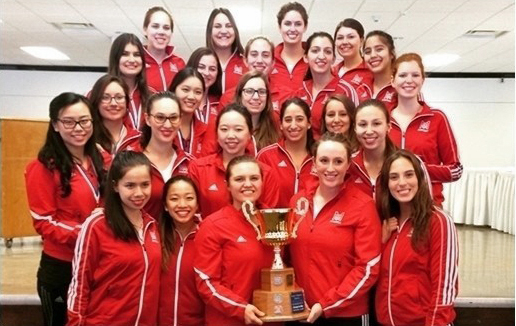 Members of the McGill Synchronized Swimming team proudly pose with the national championship trophy. Stacy Lee of Vancouver, B.C., won three gold medals as McGill captured the Geraldine Dubrule trophy as national champions of the Canadian University Synchronized Swim League (CUSSL) at Carleton University on Sunday. It marked McGill’s second consecutive CUSSL title and 12th overall since the league was formed in 2001-02. Lee, a 21-year-old civil engineering junior, won the solo routine and helped the Martlets win the combo routine, as well as the team routine, which also included Mara Bender, Jillian Boa, Lia Ciarallo, Shannon Herrick, Kelly Hersh, Megan Smallwood and Hannah Ungar. Other members of the winning combo routine included Boa and Herrick, plus Aimee Ascencio, Tamar Banon, Alice Brovkine, Helen Chan, Valerie Haber and Mathilde Warren. McGill also struck gold in the novice team routine with a group composed of Agathe de Pins, Minnie Fu, Andrea Garofalo, Diane Hardy, Jessica Insogna, Sarah Kitner, Marilou Lachance, Andrea Wyers and Diana-Luk Ye. In addition, the McGill squad posted bronze medal finishes in the solo routine (Kelly Hersh), the duet trio routine (Lia Ciarallo & Kelly Hersh) and the novice solo routine (Minnie Fu). The Martlets, who are guided by head coach Lindsay Duncan, along with assistant coaches Carrie Mouck, Alexandra Dimmer and Alicia Renaud will close out their great season with 54th annual McGill Water Show at the Memorial Pool in March. McGill’s 11 previous CUSSL championships occurred in 2002, 2003, 2005, 2006, 2007, 2008, 2009, 2010, 2011, 2012 an 2014.